Our drinkware is made out of superior Eastman Tritan plastic material. This odorless copolyester is 100% made with materials from USA, Dishwasher safe (Top rack only) , 100% BPA Free, EA and AA-Free and is also mighty durable. It sports the clarity and feel of glass while it packs unmatched durability. Plus, it will keep you and your family safe as it won't contaminate your drinks with harmful chemicals like other plain plastic glasses do. The sleek, timeless design will match all your kitchen utensil's style and can be an elegant addition to any restaurant's, bistro's, bar's or coffee shop's kitchen supplies. Single Glass Weight and Dimensions 3.66 ounces. Each glass is 4.75' inches tall, has diameter of 2.75' inches at the rim, 3.5' inches at the widest point, 2' inches at the bottom. Our top rated glasses can be the ideal gift for any occasion! 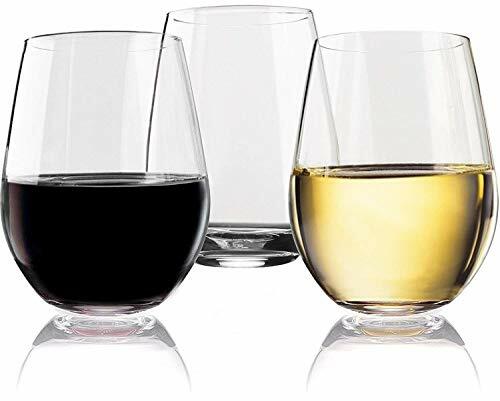 They're ideal for travel, they can be a super cool wine testing stemware/goblets and they're bound to outlast any plastic or plain glass drinkware! Buy with confidence as all our set come fully backed with a 100% Money Back Guarantee! We promise you won't find such premium quality combined with our unbeatable prices, anywhere else! ONE GLASS-UNLIMITED DRINKS: Our glassware is designed for heavy duty, daily use so that you can enjoy all your favorite beverages, drinks and even use it as a stylish bowl to have your breakfast or enjoy other delicious recipes in. Enjoy anything from wine, martinis, coca cola, vodka, gin, cognac, bourbon, margaritas, juices, soda to simply refreshing water with our premium glass set. Plus, their sleek, attractive design will make for killer presentation on any party or entertaining occasion! 100% DISHWASHER SAFE: There's a reason why all of our customers would buy again our glasses in a heartbeat; our supreme quality. The premium Tritan material is BPA-free, BPS, EA and AA-free, contains absolutely ZERO toxic chemicals and is bound to withstand hundreds of washing cycles and falls. Each glass is clear, odorless, and undergoes rigorous 3rd party tests so that maximum quality and safety is guaranteed for you and your family. THE PERFECT HOUSEWARMING GIFT: If you're looking for a highly useful, thoughtful and elegant gift for new homeowners, newlyweds or just any Birthday, Wedding, Christmas, Mother's Day etc. this unique set of glasses is bound to be an instant favorite! Choose from our set of 2, 4, 8 glasses and we promise you'll be golden! VIVOCCI-THE NAME YOU CAN TRUST: Here at Vivocci we strive to provide each and every customer with the best buying experience and product possible since it's YOU, who keeps us going strong. Every barware set is fully backed by a 100% MONEY BACK GUARANTEE for you to feel absolutely safe in your purchase. If for any reason you're not satisfied, simply return the glasses for a swift and full refund. Click Add To Cart Now and Grab the Most RISK-FREE Glassware Deal on Amazon! If you have any questions about this product by Vivocci, contact us by completing and submitting the form below. If you are looking for a specif part number, please include it with your message.